O’REANG DISTRICT, Mondolkiri province – Sitting in his home in the village of Pou Les, in Mondolkiri’s remote Dak Dam commune, Chrouet Kloeurt, a member of the Bunong ethnic minority, is in a difficult spot. The village, of about 130 indigenous families, is more than a dozen kilometers from the forest, the site of their ancestral home, and where their hearts and livelihoods remain. 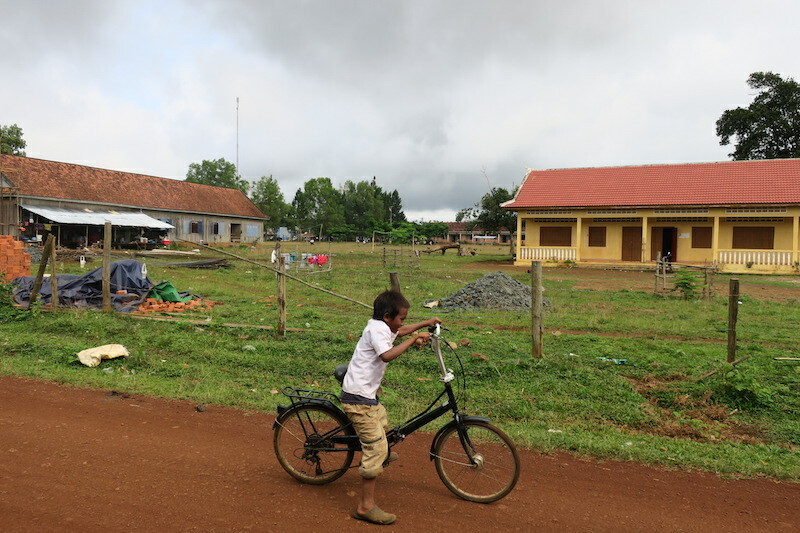 The Bunong people only moved to Pou Les after the fall of the Khmer Rouge in 1979, at the urging of the Cambodian government. It’s a small town, with steep hills and wide, red dirt roads, small pepper farms and the circular straw homes built in the Bunong style. It’s also a poor place, with wooden shacks for a police station and commune hall. There’s no market or central square for vendors. To harvest forest products such as wild honey, bamboo shoots and tree resin, which is how most community members make a living, residents of Pou Les still head to the forest around their old village near the border with Vietnam. But that forest is under threat from a Malaysian investment holding company, which received an economic land concession (ELC) over nearly all of the community’s land in 2013, and has periodically cleared parts of the forest since the ELC was granted. The land concession overlaps the site of the Bunong community’s old village, their spirit forest and their burial grounds—religiously significant areas that, according to Bunong beliefs, are not to be disturbed or logged at the risk of incurring the wrath of local spirits. Documents obtained by the Daily show that although the ELC has been plagued by years of rights and environmental concerns, and has not met all of its legal obligations, it again this month cleared about 50 hectares of land to plant coconut trees. The people of Pou Les claim several thousand hectares of forest within the 9,477-hectare ELC, granted by former Environment Minister Mok Mareth to Mega First Corporation Berhad in 2012. The agreement sets aside 839.5 hectares for the community—a share villagers in Pou Les say they never agreed to and is not nearly enough for their needs. With the help of Community Empowerment and Development Team (CEDT), a Cambodian NGO, villagers recently walked the site with handheld GPS devices, and in April released a map identifying 3,308 hectares that belong to the community—almost four times the amount noted in the ELC. About half of that land is the location of their old village, including the forest where villagers harvest fruit and honey. The rest includes farmland, their spirit forest and their burial grounds. “We plan to present this map not only to the company, but also to the local authorities and national authorities too,” said Sath Kanyara, CEDT’s executive director. While villagers in Pou Les wait for the expensive, multi-year communal land titling process to wind its way through the labyrinthine halls of the Rural Development, Interior and Land Management ministries, Mega First continues to clear the land. And according to Mr. Kloeurt, the government—commune, district and provincial authorities, all dominated by the ruling CPP—is not doing anything to stop it. “They don’t understand,” he said. 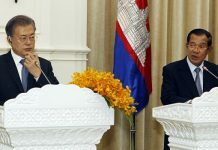 The inaction caused Mr. Kloeurt, a former CPP stalwart who still has the ruling party’s posters up in his home, to switch allegiances last year to the fledgling Cambodia Indigenous People Democracy Party. He said he was tired of the ruling party’s empty campaign promises. Mega First’s ELC in Dak Dam commune is oddly placed, for several reasons, and appears to violate Cambodian laws regulating economic land concessions and indigenous land rights. The land is located adjacent to the Vietnamese border, in a cstommune that has seen border disputes between Vietnam and Cambodia as recently as 2015. It’s also cut from the Phnom Nam Lear Wildlife Sanctuary, which has faced illegal logging in recent years. A copy of the ELC agreement reviewed by reporters was dated April 2013. However, the 2005 sub-decree on economic land concessions states that before an ELC can be granted, the company must first register with the Commerce Ministry. The Commerce Ministry registration website shows that Mega First Plantation first incorporated in October 2013, six months after its ELC was granted. Additionally, Mega First was given one year to complete an Environmental Impact Assessment (EIA) according to the original ELC agreement, giving it a deadline of April 2014. Its first EIA was produced in January last year, almost three years after its original concession, and that came only after a March 2015 letter from the Environment Ministry—under new leadership from the current minister Say Sam Al—threatened to revoke the ELC unless an assessment was produced. The company produced an additional EIA in August last year. It is unclear why it produced a second report, or whether either report has been approved yet by the Environment Ministry. Contacted on Thursday, Mr. Sam Al said he did not remember whether the EIA had been approved or submitted, and referred questions to ministry spokesmen. Ministry spokesmen Sao Sopheap and Eang Sophalleth could not be reached. Mr. Sam Al’s letter to Mega First was part of a larger, countrywide review of ELCs done by the Environment Ministry in 2014 and 2015. That review resulted in many ELCs being pared down or revoked, but left Mega First’s plot untouched. 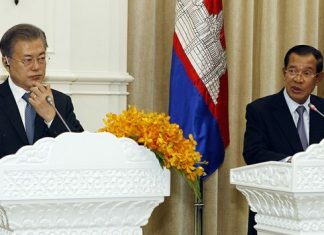 The 2015 letter lays out detailed tasks for Mega First to complete to keep its concession, including setting up a Mondolkiri office, producing an environmental assessment and resolving the land disputes. Villagers, local NGOs and reporters have been unable to locate a Mondolkiri office for the company. As for the land dispute, the letter gave the company 12 months to resolve the conflict. More than 27 months later, villagers report never having spoken with or meeting company representatives, and the company has made no offer of land that takes into account the community’s needs. Serving as an informal go-between for the two groups is Vishnu Law Group, a Phnom Penh-based law firm that is working with the Environment Ministry to craft a new environmental code and has been following the Dak Dam dispute. Brian Rohan, a legal adviser at Vishnu, said in an email that the firm is working as an “impartial mediator” in the case, but noted that Mega First has not been forthcoming. But Mega First has yet to come to the negotiating table, he said, even as community members and local authorities seemed eager to reach a solution. Mega First, headed by Goh Nan Kioh, who also is the director of Angkor Beer-producer Cambrew, did not respond to multiple requests for comment. On top of environmental concerns in its Dak Dam concession, there are legal issues regarding the Bunong villagers’ claim to the land. 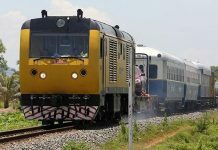 The group appears to have a strong case under Cambodian law that the company must cede the land to them, or at the very least cease its clearing operation while the government considers their communal land title. Articles 23 through 28 of the 2001 Land Law stipulate the rights of Cambodia’s indigenous minority groups to manage their land, including not only their homes but also the forests they use for agriculture and shifting cultivation, even before the groups are granted official land titles. “Prior to their legal status being determined…the [indigenous] groups actually existing at present shall continue to manage their community and immovable property,” according to Article 23. The villagers of Pou Les took the first step toward getting a communal land title in 2014, and received a letter in December that year from the Rural Development Ministry that recognized the group as an indigenous community. They are now in the second stage of the process, waiting for the Interior Ministry to recognize them as a “legal entity,” which then enables them to submit another application to the Land Management Ministry for an official communal land title. They have submitted all the necessary documents and have been waiting on the ministry’s approval for two years, according to Snguon Rathana, program team leader for the Mondolkiri office for indigenous rights group My Village, which is assisting the community with the land titling process. But none of this appears to be helping the situation in Dak Dam. Despite attempts by provincial authorities to set aside land for the villagers, and after several years of inactivity, the company began clearing the villagers’ land again earlier this month. District and provincial authorities “haven’t solved this for us yet,” Mr. Kloeurt said, noting with particular concern that the land contained spirit forests, which cover more than 100 hectares of the ELC and have remained uncut for generations. In addition to the spiritual land, much of the Pou Les community relies on the forest to earn a living, harvesting the forest’s non-timber products, and selling them in the provincial capital. Sok Ratha, the provincial head for rights group Adhoc, is working on a report on the issue and plans to submit it later this year. He urged the government to start paying more attention. “The government must accept responsibility for the people,” he said. Mr. Kloeurt agreed. His younger brother was elected as the CPP commune chief last month, and he’s hoping that his sibling can help solve the problem. But that seems unlikely without intervention from higher-level authorities or Mega First.